I’m sure that plenty of exciting things happened here at Dancing Rabbit during the past week—not the least of which is that we finally got some much-needed rain! But I’m having a hard time remembering it all over the songs in my head. I’m not the first to say it, but one of the really great things about living here is how many awesome workshops and events happen in the village. I can learn and have fun and meet people and eat amazing food—and then go home to sleep in my own bed. 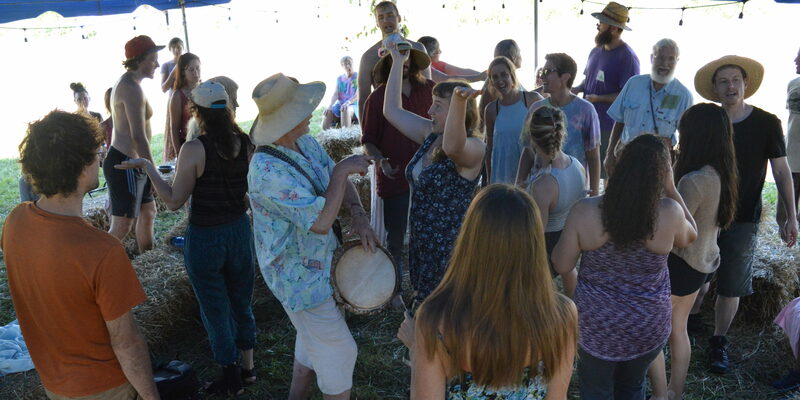 Christina here, writing on the last day of Singing Rabbit, a 95-person community singing festival that is happening right now in my own backyard. Annie and Laurence leading a stand up and dance song circle! It’s not exactly easy to define community singing. It almost always involves sitting in a circle, though sometimes we stand in a tight bunch or walk around to hear each other. Sometimes we sit around a fire, though it can also take place while waiting in line or walking on the path or anywhere that two or more people sing together. Usually the lyrics are simple and easy to learn, though this weekend I learned three different songs in Georgian (as in the country, not the state) that were quite challenging. Often there are intricate harmonies created by the different voices, though sometimes we all sing the same melody together. 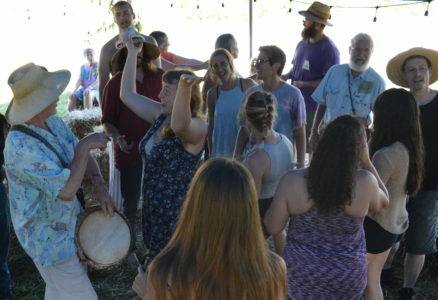 Sometimes, as is the case this weekend, community singing events involve shared meals, fun activities, and other ways of connecting. Community singing is always welcoming of anyone who wants to try to learn the words—or even just hum along or sit quietly in the center of the circle without making any noise at all. And of course, it always involves lots and lots of songs. This weekend started on Friday night with a shared meal and a fireside song circle. We gathered in a circle and sang a song together, went over a few logistics of the weekend, and then grabbed our bowls and plates and lined up to eat dinner together. As many of the people traveling to the event had not yet arrived, the fireside song circle that night was smaller, but we learned many new songs and sang some favorites all while looking at the amazing Missouri night sky full of stars. Something else that I’ve really come to appreciate about living here is all the interesting people who pass through for one thing or another and are happy to share their gifts or knowledge. The morning workshops were what are called “community offerings.” In other words, people who know how to do something offer their skill to anyone who wants to learn. Breakfast started at 8 am in the main tent, aka “The Hub,” with oats and eggs and lots of fixings. After holding a morning circle to go over more announcements or logistics and to point out the poison ivy patches around the tents, we broke off into the first of many smaller, daytime song circles. These smaller circles, scheduled at 10:00 and 4:00 each day were led by amazing song leaders in the US who traveled in for the event. I’m constantly amazed by what they can do with people, many of whom have never met before, to create beautiful music simply with their skills of leading. I learned many new songs and sang some of my favorites from past circles. More shared meals, more community offerings, and many trips to the pond rounded off the weekend. Again and again, I was so grateful that I was able to retreat to my house to rest or change my clothes or work on the tomato harvest. One of the highlights of the weekend for many was the five-hour grief ritual on Sunday afternoon led by Laurence Cole, who travelled here from an ecovillage in Washington state. Another thing that I have come to appreciate about life here is the way we embrace and celebrate things that are often ignored or rushed over in mainstream society—conflict, darkness, death—we celebrate it all. Another highlight of the weekend was the “No-Talent Show” on Sunday night. This has been a Dancing Rabbit tradition for a while now, and it is so much fun to encourage anyone to share their “talent” with the group. If there was a theme to the event, it was people making interesting sounds with their bodies—oh, and handstands. Today is the last day of the weekend event. I admit I’m tired after a few extra late nights and so much activity, and I’m almost ready to return to the day-to-day routine. Sometimes I need a break from growing and learning and stretching my comfort zone. But in just a few weeks, I’ll be gearing up for another great event here. I’ve registered for the annual Permaculture Design Class this year and it starts in three short weeks! I’m looking forward to another great party/learning experience/world-class workshop happening right here, in my own backyard. Want to see what living cooperatively is really like? Come visit us this year to get a glimpse into how we live and how you can incorporate these practices into your own life. There is only one Sustainable Living Visitor Program session left and the Permaculture Design Course happening between now and October. How will you choose to get involved? Really good summary, and wonderful event! I hope to make it again!